The holiday season often comes with the customary race to decorate your home in order to stay in line with the festive season’s mood, but do you know just how much juice all those lights take up? Why not take a more eco-friendly route with the Solar Powered Holiday Lights instead? At least you can lead your kids by example on how to keep the earth green by doing your part. Unlike standard outdoor holiday lights that must be tethered to an electric source, these solar powered lights can be strung anywhere in your yard. A small solar panel stakes into the ground up to 7′ away from the light strand and powers 102 bright LEDs for up to nine hours after an eight-hour charge. Seven different light patterns dance along the strand in succession, or you can select your favorite sequence to flash continuously or have the lights provide steady illumination with the touch of a button. The solar panel gathers moderate or direct sunlight during the daytime and automatically turns the lights on at dusk and off at dawn. The 32′ 9″-long strand provides enough slack to adorn trees, railings, or lampposts. The LEDs are rated for 10,000 hours of operation. Includes two rechargeable batteries. Specify red, green, or a combination of red and green. 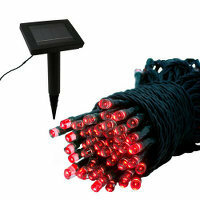 Expect to pick up the Solar Powered Holiday Lights for $59.95 from Hammacher.